Neville, who is owned by 10 members of a syndicate bearing his name, never seemed to feel as badly as he should have and he began making a miraculous recovery. Through the help of his vet (Dr. Kevin Keane), his groom (Lindsey Taylor) and the Fair Hill Equine Therapy Center (where he visited the Hyperbaric Chamber) Neville defied the odds and made a miracle trip to the Land Rover Burghley Horse Trials in England in September. He rocketed around the cross-country course clean and fast and finished seventh at the world’s toughest CCI4*. Braver than brave, Neville Bardos’ courage saw him through more than just a difficult cross country course it helped see Martin through the rebuilding of his own life. Shortly after the fire, Martin lost his father in a bicycling accident in Australia. Shortly after that Martin’s wife Silva lost her father to cancer. It was a nightmare summer for the Martin’s and Neville’s success helped them find their way through it. In 2011, he was also second at the Red Hills Horse Trials in the CIC3*(in March), fourth in the Advanced at the Millbrook Horse Trials in August. If Neville Bardos had lived the rest of his life in the field this story would have had a no less incredible and happy ending. But Neville was looking to make a miracle and tonight was the next chapter in that mission. Hear the reaction to Neville Bardos’s win here: http://www.usefnetwork.com/blogs/187/boyd_martin_on_neville_bardos_win.aspx. Not to be outdone by a tearjerker Sjoerd’s year on the National circuit was one of insurmountable success. Xena Vimercati’s stallion won and won and won. He transcended divisions, riders and classes. Anyone lining up against the striking jet black Friesian knew that to try to beat him they better bring their A game. He was honored for his confirmation and presence in the ring and with his panache and personality he garnered fans everywhere he went. He was undefeated in 2011 in the Halter division. Sjoerd was named World or Grand National Champion 14 times in 2011. He also added four World/Grand National Reserve Champion titles to his list. At just six years of age, Sjoerd is beginning to build a dynasty. He won back-to-back Shakespeare Perpetual Hi-Point Friesian Trophies and Jeff Wonnell Memorial Versatility Silver Belt Buckles continuing a streak that began in 2010. He also scored the Robin ut de Warren Memorial Perpetual Trophy, World Champion Saddle Seat Open, 19 Regional titles and 5 Reserve Championships. He won with 10 different people in 2011, demonstrating his versatility and trust. He won across the country, picking up championships in California, Colorado and Virginia. He won with multiple riders across divisions at the same show, exemplifying his ability to adapt to different styles of riding in the different classes he contested. He won Equitation, Dressage, Liberty, Walk/Trot, English Pleasure, Trail, Hunt Seat Pleasure, Saddle Seat, Western Pleasure, Junior and Amateur Classes. As a sire, he is already beginning to prove his mettle. 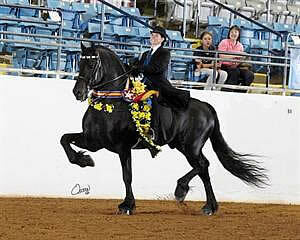 He is the sire of TDR Zivah the Diva who was the 2011 USEF Grand National Champion Part-bred Friesian. In 2010 and 2011 she was the Grand National Part-bred Halter Champion. Sjoerd’s foals, although only yearlings and weanlings, are consistently winning top honors in the show ring. They carry his looks and his talent with them. Hear the reaction to Sjoerd’s win here: http://www.usefnetwork.com/blogs/186/sjoerd_wins_2011_national_horse_of.aspx. Starr Llight is frequently referred to as both Dynamic and a Diva. Every time the now 16-year-old Arabian mare enters the ring she rises to the occasion. With her young owner Leah Beth Boyd in the stirrups, Starr Llight ended up winning a spectacular ride-off for the coveted Open Purebred English Pleasure title at the 2011 Arabian National Championships. With that victory, Starr Llight became the winningest Purebred English Pleasure mare of all time and is only the second mare since 1988 to win the title. 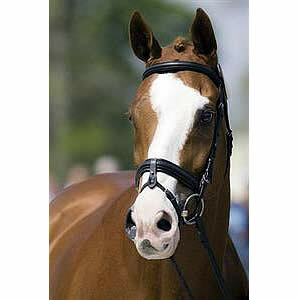 She is also the oldest mare, and second oldest horse overall, ever to garner the coveted prize. Purchased by her young owner in 1999 from a dispersal sale, this mare has now won 11 National or Reserve Championship titles. Boyd and Starr Llight are the only Arabian horse/rider team to win a National Championship in the Junior exhibitor, the Amateur exhibitor, and the Open division. When it comes to the Five-Gaited division for Saddlebreds, High Hickory Farm’s CHThe Daily Lottery put together an undefeated record in amateur competition in 2011. CHThe Daily Lottery scored Grand Champion titles at the UPHA/American Royal, Kentucky Fall Classic, Midwest Charity Horse Show, Bonnie Blue National, and the Kentucky State Fair World’s Championship Horse Show and dominated every time he set foot in the ring. The now 8-year-old is no stranger to success with his rider Gabe Deknatel and his consistency and big motion are impossible to ignore. Trained by John and Tammie Conatser, CHThe Daily Lottery is handsome, fast and seemingly invincible. Though small in stature (15.3h) and nicknamed “Shrimp,” Coral Reef Via Volo is a giant when it comes to jumping. With one of the world’s best riders, Beezie Madden, aboard she topped the Rolex/USEF Show Jumping Ranking List for much of the 2011 competition year and went on to impress the world at the Pan American Games in Guadalajara, Mexico. She led Team USA’s Gold-medal effort, which also secured 2012 Olympic qualification. She added only one time fault through five rounds of jumping and won Individual Silver to back up the Team Gold. In 2011, Coral Reef Ranch’s Via Volo and Madden racked up numerous wins across the globe. They were on the winning team in the Nations Cup at the CSIO4* Wellington. They won the D-LINE Cup 1.60m Spruce Meadows and the Longines International Grand Prix of Rotterdam (CHIO). A recent partnership, having won their first competition together just over a year ago, the future for Coral Reef Via Volo is bright. Bruce and Jen Hlavacek’s Weltino’s Magic was undefeated in 2011, winning with Steffen Peters at the Intermediaire I level at the Festival of the Horse CDI and the Del Mar National CDI in California before heading to CHIO Aachen and taking on the best small tour horses in the world. Together they continued their unbeaten streak in Aachen, Germany, and then returned home to sweep all three tests in the USEF National Intermediaire I Dressage Championships at the 2011 Collecting Gaits Farm/USEF Festival of Champions in September to earn their spot on the U.S. Team for the 2011 Pan American Games in Guadalajara, Mexico. They continued to set a remarkably high standard at the Pan American Games and brought home Team and Individual Gold medals. ‘Magic’s’ character comes through in his performance and he has evolved into a top contender since he was started by Peters’ wife, Shannon. With Shannon he was Markel/USEF National Young in the Six-Year-Old division. Dozens of champions were honored across the USEF’s 28 Breeds and Disciplines tonight. From jumpers to hackneys, vaulting horses to parade horses, the evening recognized the best horses from 2011. The reception and the HOTY dinner were made possible by Adequan, a steadfast supporter of the USEF. For more information about our other Annual Meeting Sponsors please visit: http://www.usef.org/convention/2012/sponsors.aspx. More information about the Horses of the Year and the 2012 Annual Meeting is available here: http://www.usefnetwork.com/featured/USEFAnnualMeeting2012.